In 1969 the United States beat the Russians to the moon with Neil Armstrong and "Buzz" Aldrin being the first humans to leave their footprints there. The United States wanted to honor this accomplishment on a coin. Unfortunately, the cent, nickel, dime, quarter and half dollar, for one reason or another, were off-limits for a redesign. Therefore, the United States Treasury Department decided to revive the dollar coin that had not been minted since 1935. The new one dollar coin would be the same diameter and approximately the same thickness as previous minted silver dollars, but the composition would be a copper-nickel clad base metal composition that is dictated by the Coinage Act of July 23, 1965. Mint engraver Frank Gasparro represented this historic event on the reverse by adapting the Apollo XI insignia from NASA. It was President Dwight D. "Ike" Eisenhower who authorized the creation of NASA in 1958. Because of his involvement with NASA, the Treasury Department chose Eisenhower for the obverse of the coin. In 1973, the Treasury Department began a contest to select the design to commemorate the 200th anniversary of the American Revolutionary War on the quarter, half dollar and one dollar coins. The Treasury Department chose Dennis R. Williams' reverse design on March 6, 1974, that superimposes the Liberty Bell on top of the moon for the reverse of the dollar coin. The United States Mint did not make any dollar coins dated 1975 since the production of the dual-dated (1776-1976) bicentennial coinage began in 1975 to meet the public's demand for these new circulating commemorative coins. 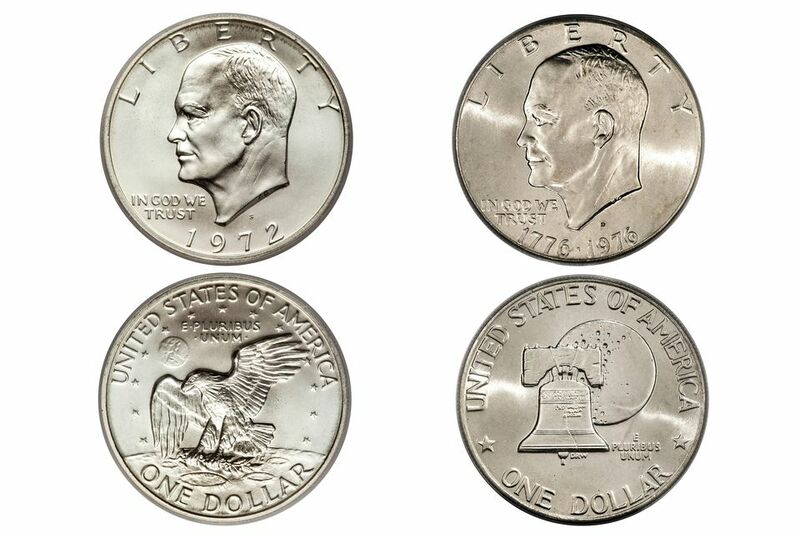 At one time, coin collectors frowned upon collecting Eisenhower dollars. The coins never circulated well with the public, the design was drab, and the coins never struck up well. Beginning in the mid-to-late 2000's, the popularity of collecting the last of the big United States dollars began to catch on. Coin experts began to find varieties, and the values for Eisenhower dollars began to rise. Mint Mark Location Above the '7' in the date on the obverse. Obverse Description President Dwight Eisenhower facing left, with LIBERTY above and IN GOD WE TRUST to the lower left and the date at the bottom. Reverse Description Eagle holding an olive branch, landing on the moon, with the earth in the background with 13 stars in the field. The inscription E PLURIBUS UNUM above. The inscription UNITED STATES OF AMERICA, ONE DOLLAR at the border. Obverse Description President Dwight Eisenhower facing left, with LIBERTY above and IN GOD WE TRUST to the lower left and the dual date 1776-1976 at the bottom. Reverse Description Liberty Bell superimposed in front of the moon. The motto E PLURIBUS UNUM appears to the lower right. The inscription UNITED STATES OF AMERICA and ONE DOLLAR separated by two stars surrounds. Notes No coins dated 1975 were minted. Minting of the Bicentennial coins began in 1975 and continued throughout 1976. They have the dual date of "1776-1976". The United States Mint Produced the Eisenhower dollar from 1971 until 1978 when the Treasury Department replaced it with the Susan B. Anthony dollar. You can learn about years, strike type, mint facility where struck, the mint mark used on the coin and a description of any type differences in coins minted for that year. The following are popular errors and varieties that Eisenhower Dollar collectors look for. These coins usually carry a premium and are valued above a common coin. 1971 Silver Proof San Francisco S Partial Peg Leg "R" Part of the serif on the "R" in Liberty is missing. See Eisenhower Dollars Key Dates, Rarities and Varieties for more information. 1971 Silver Proof San Francisco S Peg Leg "R" Missing the serif on the "R" in Liberty. 1972 Philadelphia Three different type of reverse dies were used Look at the Earth on the reverse to distinguish between the three type. The United States Mint struck Eisenhower dollars (Ike dollars) over the span of eight years using a variety of different compositions and strike types.